NASA's life-hunting 2020 Mars rover has cleared an extensive review process and is now ready to begin the final design and construction phase, agency officials announced today (July 15). If all goes according to plan, the six-wheeled robot will blast off in August 2020, touch down in February 2021 in a yet-to-be-determined spot, and then explore the Martian surface for at least two years, mission team members said. The modern Martian surface is cold, dry and radiation-blasted, but this wasn't always the case. For example, NASA's Mars rover Curiosity discovered that the huge crater it landed in hosted a potentially habitable lake-and-stream system billions of years ago. And other spacecraft have turned up additional evidence that the ancient Red Planet was a relatively warm and wet world. "The Mars 2020 rover is the first step in a potential multi-mission campaign to return carefully selected and sealed samples of Martian rocks and soil to Earth," Geoffrey Yoder, acting associate administrator of NASAꞌs Science Mission Directorate in Washington, D.C., said in a statement. "This mission marks a significant milestone in NASA’s Journey to Mars — to determine whether life has ever existed on Mars, and to advance our goal of sending humans to the Red Planet." The 2020 rover will also carry an instrument called MOXIE (Mars Oxygen In-Situ Resources Utilization Experiment), which will generate oxygen from the carbon-dioxide-dominated Martian atmosphere. Such work will demonstrate technology that future human explorers could use on the Red Planet, NASA officials have said. 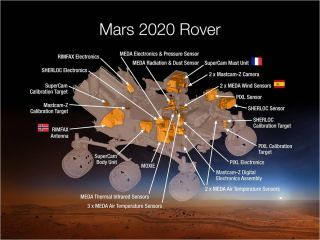 This image is from computer-assisted-design work on the Mars 2020 rover, which will hunt for signs of past Red Planet life. The rover will also use ground-penetrating radar to characterize the subsurface environment. Another instrument, called SuperCam, will fire a powerful laser at rocks, vaporizing them and allowing Mars 2020 to determine their composition from afar. Other instruments include high-resolution cameras, an advanced weather station and spectrometers that will potentially enable mission scientists to detect carbon-containing organic molecules — the building blocks as life as we know it — in Martian samples. Mars 2020 will also use the same parachute-and-sky-crane landing system that got Curiosity down safely in August 2012. The 2020 rover team is making a few improvements, however, including the addition of a "range trigger" that will allow the parachute's opening to be controlled more precisely. Mars 2020 should also be able to navigate better during its harrowing descent through the Martian atmosphere, mission team members said. "As it is descending, the spacecraft can tell whether it is headed for one of the unsafe zones and divert to safe ground nearby," Allen Chen, Mars 2020 entry, descent and landing lead at NASA's Jet Propulsion Laboratory (JPL) in Pasadena, said in the same statement. "With this capability, we can now consider landing areas with unsafe zones that previously would have disqualified the whole area," Chen added. "Also, we can land closer to a specific science destination, for less driving after landing." The rover's descent and landing will also be documented like never before, thanks to data gathered by multiple cameras and a microphone. Microphones have flown aboard previous Mars missions, but none have actually been used on the Red Planet, NASA officials said. "This will be a great opportunity for the public to hear the sounds of Mars for the first time, and it could also provide useful engineering information," said Mars 2020 deputy project manager Matt Wallace, also of JPL.